These tech-driven buyers expect to find answers, not a sales pitch. As the contracting industry workforce gains more millennials, and their predecessors phase out in the coming years, the building products manufacturing segment will need to rethink its marketing game. Older established approaches, like cold calls and sales appointments, are giving way to real-time answers and mobile resources that cut to the chase. So an integrated, mobile strategy incorporating distributors, manufacturers and retailers has the most appeal now. 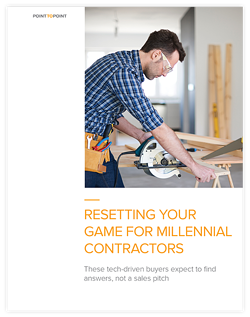 Fill out this form to receive our guide on how to market to millennial contractors.